There were 68,216 acres of pear trees in the U.S.
(latest USDA ag census in 2007). The Pear (Pyrus communis) was designated as the Official Fruit of Oregon in 2005. Green Anjou pear puree is used to flavor the 'Juicy Pear' variety of Jelly Belly gourmet jelly beans. 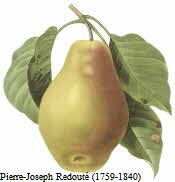 There are more than 5,000 varieties of pears, not all of them are pear-shaped. They have been cultivated since before 2000 B.C. The leading pear producers, in order are Italy, China and the United States. The Seckel pear was discovered growing near the Delaware River in Pennsylvania in the early 18th century by a farmer named Seckel. Pears have been cultivated for about 4,000 years, and are now grown in almost all temperate regions of the world. There are more than 5,000 varieties.